While Jackie was out the other night, I had to itch my crafting bug and make something. I came across this tutorial on Homepodge (a compilation of submitted crafts and home decor) and have been wanting to get this project done for the past month or so. 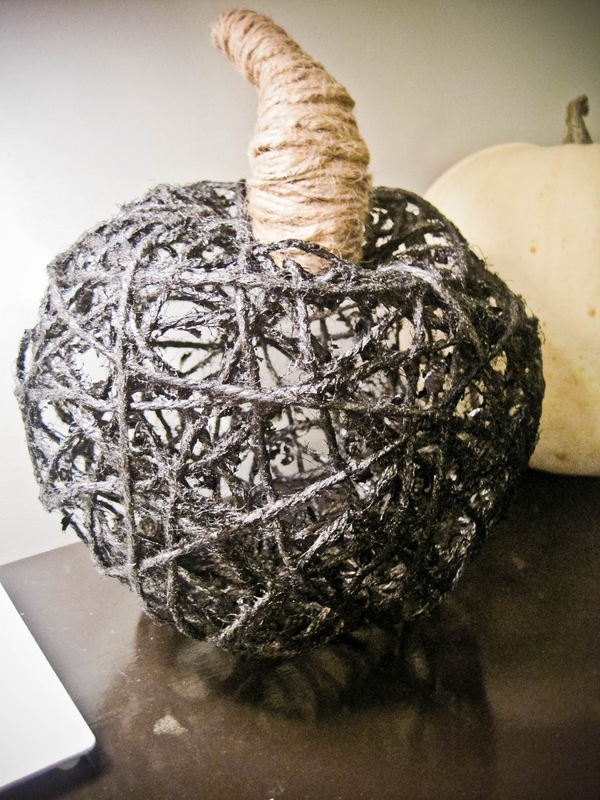 The twine pumpkin is not my original concept or idea, but I'm really pleased with the results. Out of the closet reno we gained a much roomier closet for storage- but I also found the extra floor space perfect for getting projects done- the closet has essentially become my own workshop. The supplies for the craft were simple enough: twine, glue, and a balloon. 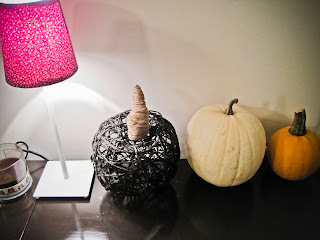 The project required me to blow the balloon up (to about the size of a pumpkin), and wrap glued twine tightly around the balloon in haphazard sweeps. It seemed easy enough in theory, but it was quite difficult to keep the string glued down. It kept flopping off, and sticking to me, and I ended up becoming a gooey-sticky-peeling-mess. Eventually I learned the secret was to pull the string VERY tight, and it stayed put. I let the balloon-covered-in-glued-string mess dry for about 2 hours, at which time, it had dried a bit and was pliable. I popped the balloon, and sculpted the string into a pumpkin shape and let it dry over night. At this point, I was less than impressed with the effort, and figured that I had just wasted a roll of twine, a bottle of glue, and my time. The next morning, I awoke to a hardened string ball, and was thrilled that it actually worked! To finish it off, I spray painted a coat of Oil Rubbed Bronze (*yum*) to give it a bit of shimmer. For the stem, I sculpted a sheet of aluminum foil into a stem shape, and tightly wrapped it in the twine (unpainted). I left a small hole in the bottom of the pumpkin for some mini lights, and when I get the chance, I'll put some in there to have some sweet Fall ambiance. We had my mom and brother over the other night, and she was convinced that I had bought the pumpkin at a store- which is always a great compliment to receive! 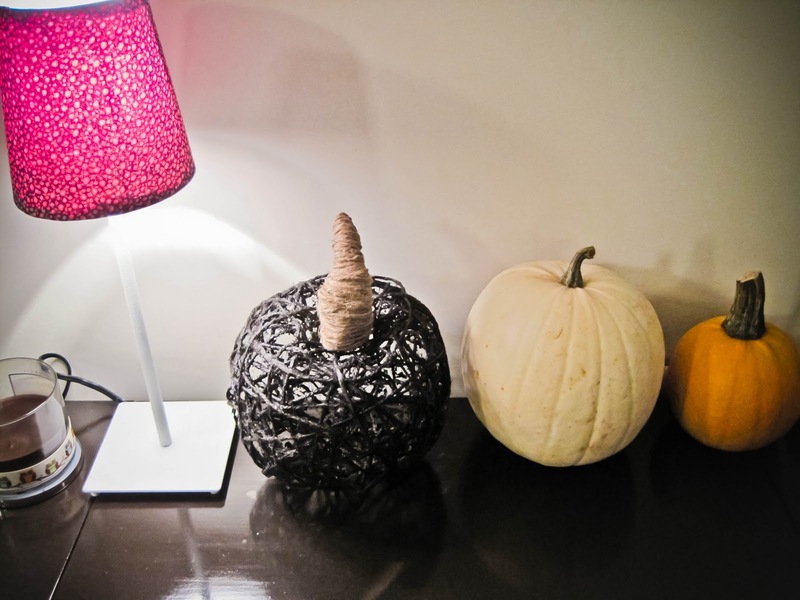 The pumpkin is part of our Fall vignette for 2011, and for many Falls to come! I've been aching for the past month to do some sort of Fall craft project, and I definitely recommend trying this one out! It's easy, cheap, and the results are fantastic.